The mobile messaging app landscape continues to be highly geographically fragmented, with different messaging services doing well in different global regions. Despite ongoing localised variety, messaging veteran WhatsApp remains dominant in multiple global regions, even as relative newcomer — to Android and iOS — BlackBerry Messenger (BBM), gets a foothold on the social chit-chat map of these two platforms. According to a survey of 3,759 Android and iOS users in the U.S., Brazil, South Africa, Indonesia and China, carried out by mobile market research firm On Device, WhatsApp is the leading app for social messaging in South Africa, Brazil and Indonesia, and second most popular in the U.S., giving it a better geographical spread than Facebook’s Messenger app (which only leads in the U.S., and is ranked second in Brazil and South Africa). 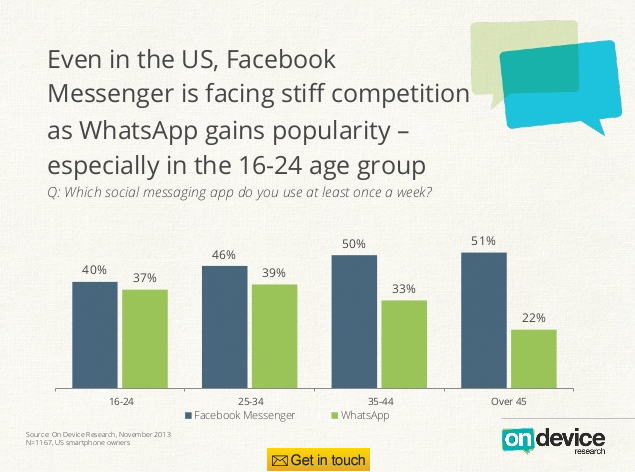 The data also notes relatively little overlap between the two messaging apps in the U.S. market, with only a quarter of U.S. smartphone users using both Facebook Messenger and WhatsApp, and the majority os users sticking with one or the other. Across On Device’s five polled markets, 44% of mobile users said they use WhatsApp at least once per week vs 35% who said the same for Facebook Messenger. 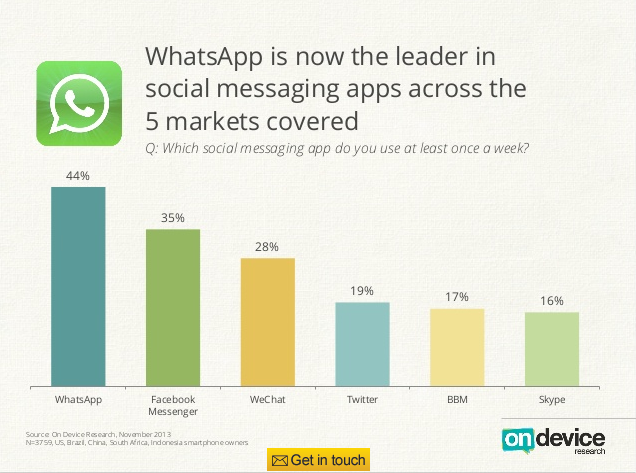 China’s WeChat app was third, with more than a quarter (28%) of respondents using it at least once weekly. But the dynamism of the mobile messaging space is underlined by the presence of BlackBerry’s BBM app — which was only released for Android and iOS a few weeks ago, but has already become the fifth most used social messaging app across the polled markets. Across all five markets, On Device’s data shows that BBM is used at least once per week by 17% of survey respondents — putting it just behind Twitter (19%) and ahead of Skype (16%) for usage. Not bad for a platform newbie, especially after such a difficult start. Turning to market specific data, BBM is ranked third most popular in South Africa, and second most popular in Indonesia, according to On Device’s data, used by 34% and 37% of respondents in those two countries, respectively (behind WhatsApp and Facebook Messenger in South Africa; and WhatsApp in Indonesia). South Africa and Indonesia are two of the markets that have historically been strong ones for BlackBerry so there are clearly still enough mobile users with friends on the BBM network to generate momentum for the company’s cross-platform BBM play. Let’s also not forget BBM has been around since 2005 — so it’s actually a grand old daddy of mobile messaging, albeit one that’s finally been unchained from BlackBerry’s own rails to run free. The company is evidently doing what it can to maximise the power of its brand in key legacy markets to generate BBM momentum. It’s just today announced that BBM will come preinstalled on a variety of Android devices starting next month, from OEMs in Africa, India, Indonesia, Latin America and the Middle East. Smartphones in these regions that will include BBM out of the box include devices from Be, Brightstar, Celkon, EVERCOSS, IMO, Micromax, Mito, Snexian, Spice, TECNO, TiPhone and Zen, it said today. The BBM app will also continue to be available as a free download on Google Play but being preloaded ups its visibility and lowers the barrier to usage so it’s a huge advantage. From the OEMs’ point of view, these guys get to associate their hardware with a brand that is still well known and popular in their respective markets to make their handsets stand out from other low cost ‘Droids. “BBM is incredibly popular in Indonesia and since it’s availability on Android, it’s become the must have messaging app for our customers. We are therefore thrilled to be working with the BBM team at BlackBerry to preinstall BBM on our devices, making it easier than ever for our customers to get connected to BBM contacts and start chatting,” said Janto Djojo, Chief Marketing Officer at EVERCOSS, in one of multiple supporting statements accompanying the BBM preload news. Returning to the On Device survey, the average number of messaging apps installed by users across the polled markets varies considerably, from a high of 4.2 (on average) in Indonesia and 4.1 in South Africa, to just 2.6 in Brazil, 2.4 in China, and — with the lowest of the polled markets — 2.1 in the U.S.
It’s perhaps no coincidence that BBM has managed to get most traction in the markets where users are more open to using multiple messaging apps since it doesn’t have to worry about trying to replace WhatsApp or Facebook. The survey shows China’s WeChat is also on the rise. On Device’s data shows the app — that’s known as Weixin in its home market but branded WeChat for international markets — is “spilling out of China”, with a fifth (20%) of Indonesian, and 18% of South African smartphone owners saying they now use it weekly. The survey also touches on SnapChat — the ephemeral photo-sharing app that’s attracted huge interest in recent weeks, following reports that it snubbed a $3 billion acquisition offer from Facebook. 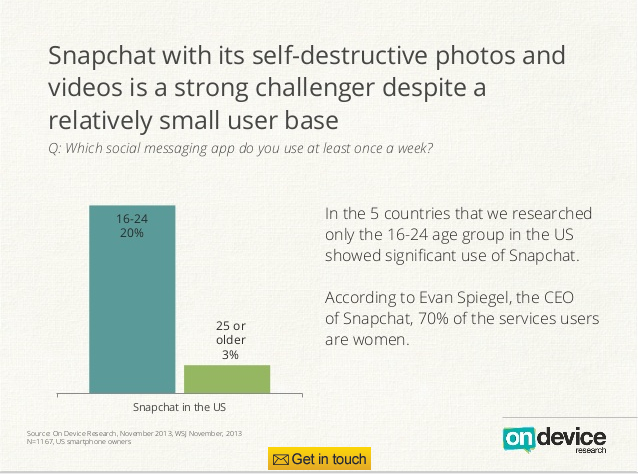 Questions over exactly how sizeable SnapChat’s user-base is persist, as the startup isn’t saying. It prefers to talk in terms of Snaps shared (400 million daily — albeit some of those Snaps might be going to multiple people). Despite all this interest in SnapChat, On Device found no significant use of the app across the markets it polled — with the sole exception of the 16-24 age-group in the U.S. A fifth (20%) of polled users in this age group reported using it at least once per week vs just 3% of those aged 25+. So clearly American teens are a very lucrative demographic. 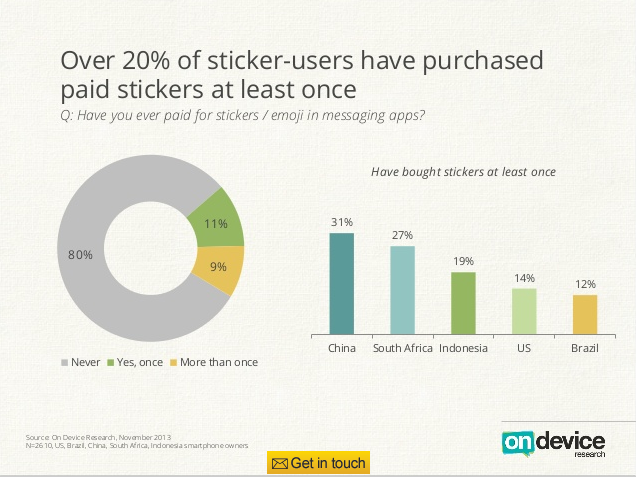 The survey also touches on stickers — a popular monetisation method for mobile messaging apps. 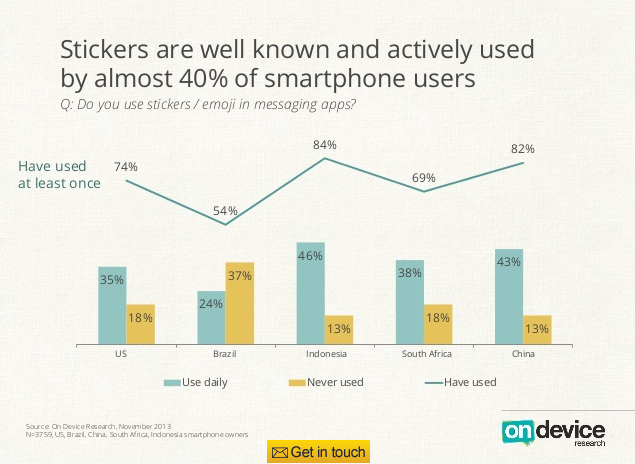 According to the data, almost 40% of polled smartphone users actively use stickers, with rates of usage varying by market from a high of 46% of Indonesians, who say they use stickers daily, to just under a quarter (24%) of Brazilians. When it comes to actually paying for pixels, more than a fifth of all the polled mobile users said they had paid for stickers/emoji in messaging apps at least once.